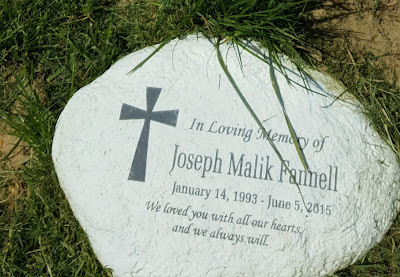 My son, Joseph Malik Fannell, 22, was killed by a driver who ran a red light. This blog was created to chronicle the emotions and stages of my grief following his death. Grief is a state of being. It never ends. We never get over it or through it. We just find ways to endure. "If your heart is broken, you'll find God right there; if you're kicked in the gut, He will help you catch your breathe." Psalm 34:18 In the shadow of your grief, remember to breathe. This was the day. May 22, 2018. Almost three years to the date that Joseph was killed, this day, we finally got to face the man who killed my son. I hear you ask, “Why do you reference him that way?” You see, though that man has a name; that name that personified the life he had prior to Joseph’s death, changed, the day he decided to run that red light. He killed my one and only son and that day, June 5th, (three years ago today) his name was changed. The man who killed my son. And it’s no longer a matter of forgiveness or moving on or any of that, for those that do not understand. I have forgiven, and my life has moved on, albeit, involuntarily, but it doesn’t change the Truth of that day nor of what happened, no matter what I call him or what his name is. Our lives, our family, was forever changed that day. June 5th, 2015. No longer can we refer to things as they are. (Even that man’s name). Because dates like June 4th, the day of the incident; June 5th, the day of Joe’s death and May 22nd, take on new meaning. We now refer to our lives in reference points… before Joe’s death and after it. Terms like prior to, following, when [he was still here], up until, have become a permanent part of vocabulary. All kinds of references that point to his death. His absence. His not being here. May comes calling and it isn’t the same. I hear Happy Mother’s Day from only two of my children, which only highlights that Joseph is gone and he will never utter the words, thank you Mom, again. His death has made a permanent scarring, where in subtle ways, these reference points play prominent roles in our lives, in network names and hashtags. May 22nd, 2018, the day I saw my son’s killer for the first time ever. May 22nd used to have a whole other meaning for me. It was the day my husband and I decided to get married. The day of the proposal, over 38 years ago. Now it has become the day I finally got to see the man who killed my Joseph during the first day of his trial. Even our Anniversary, May 15th is thrown in, in the midst, and has become bittersweet. I’m happy and sad at the same time. My birthday rolls round, still May. May 29 comes, and there marks the beginning of a cycle of remembrance. The cycle of remembering every single last detail of the events that followed that day. Reference points. How Joseph gave me a gift, “But it’s green,” he said, “Green is your favorite color.” So thankful that wisdom got the best of me, and I saw his heart of love in it hugged him and thanked him for the thought. Then it was time for dinner. He sat next to me at the restaurant we favored, as he normally would, asking me how the lump crab that I ordered tasted. References. Permanent marks on the calendar of my heart. I remember the next day. May 30th. Another mark. We got up early that day and drove to Virginia to celebrate a friend’s 50th birthday. Joe didn’t come with us, choosing instead to stay at home. And we didn’t see him again until Sunday morning at church, as we got up early that morning to make it there in time for Sunday morning worship. That was May 31st. The last day that I would see him. The last time I would hear his voice. Another reference. That Sunday afternoon on May 31st, I had not spent too much time with him, but enjoyed listening to he and his dad as they watched or prepared to watch a basketball game that would lead up to the championship later that week. Crazy, how this year the same teams are in that exact position. And as much as I love the ‘On This Day” app on Facebook, I so dreaded seeing pics to remind me of that final week. May 29 – June 5, 2015. Last Tuesday (my birthday), to this Tuesday, the date of the day my Joe died. And really not looking forward to the next seven days either, because June 12th rolls around. The day we buried him. Reference points. All of them. Times and dates permanently etched into my memory bank. May 22, 2018, a reference point. Yet another “after Joseph’s death.” Another day added, rather changed, on my calendar. The day I faced the man who killed my son and actually realized he didn’t matter anymore.